This is the third post in the series on Academic Strategic Enrollment Management. 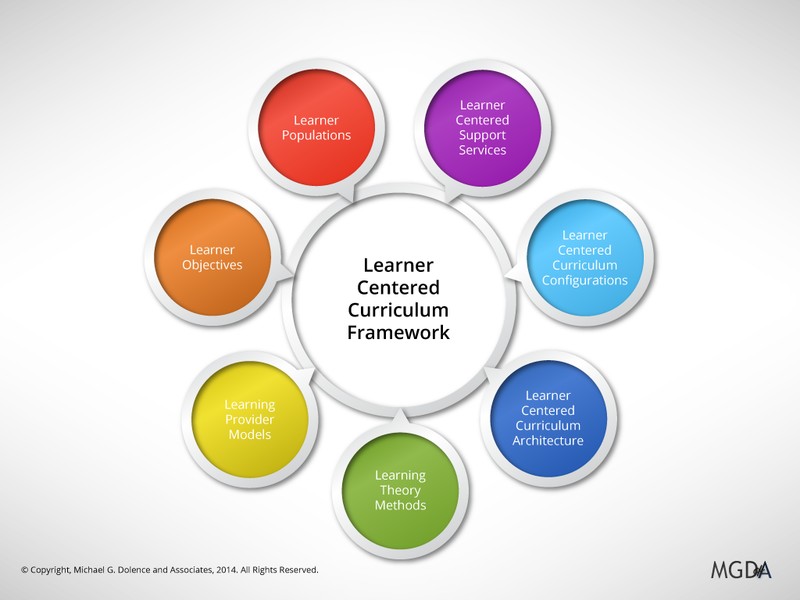 What is the Learner Centered Curriculum Framework? These constructs are, in turn, decoded or operationalized through seven learner-centered questions. When asked and answered, the questions are ideal for building, improving, and sustaining design integrity across curricular elements and guiding a wide array of institutional internal and external alignments. The Learner-Centered Curriculum Framework is a tool that helps frame strategic dialog and analysis around the principles and practices of the concept learner-centered academic environments. This article describes the seven learner-centered questions that emanate from the Learner-Centered Curriculum Framework and help frame a basic enrollment management perspective useful for strategic enrollment management professionals when they dialog with academics. The table below can be printed and guide deeper insight into the options revealed through each question. The elements under the questions are not to be used as a check list but rather a list of prompts and possibilities. We invite constructive comments and suggestions as-well-as any case examples of its use. A deep understanding of the populations to be served is required for effective curriculum design and delivery. For this reason, the very first question to be addressed is: Who are the learners? The answer flows from and can inform an entity’s strategic decisions regarding mission, vision, and strategic position (see Developing Institutional Strategy). Several questions cascade to give deep meaning to this basic question. Who are the learners of the 21st century? What learner populations does the institution currently serve? Who could or should the institution be serving? And, so on. Understanding who the learners are is an essential and often overlooked component of shaping curriculum for a changing society. The foundation of a learner-centered approach is to fully understand learning demand as segmented by salient learner population characteristics. Once understood, academic planners can identify gaps between the learner populations present in society, those the institution desires to serve, and those it currently serves. A learner-centered approach, guided by the Learner-Centered Curriculum Framework, is most fruitful when supported by open inquiry and discourse regarding the learner populations found within an institution’s target market areas and those within the global learning marketplace. A related set of questions emanates from the second learner-centered question within the Learner-Centered Curriculum Framework: What objectives do the learners seek? Related questions include: What do the learners of the 21st century seek? What are their learning and credential objectives? How do objectives change in the course of a person’s life? Learners seek a vast array of learning objectives and these objectives vary over time and the course of one’s life (see 5 Bold Predictions For The Future Of Higher Education). Knowledge of learner objectives is a prerequisite for understanding motivation and, therefore, should guide the sequencing of learning experiences as well as inform marketing, recruitment, and retention efforts. Learner objectives should be a fundamental design element for the overall structure and intent of a curriculum and, therefore, incorporated early in program and curriculum design and review processes. A third area of inquiry flows from asking: What learning provider models are available to the learners? Corollary questions include: What options are open to 21st century learners as they seek their objectives? What curricular models, business models, and assessment models are in play? What choices do various learner populations make and why? What evidence exists on the effectiveness of the various provider models? The digital knowledge age is an age in which learning opportunities can be made available to learners anytime, anywhere. As a result, a complex network of learning resources and provider models is emerging to meet the demand for learning across multiple venues. Models range from traditional collegiate models to open-term models, online, and a host of other variations. Faculty, academic leaders, strategic planners, and curriculum designers are well advised to fully explore, describe, and understand various provider models in order to adequately assess the emerging learning landscape. Such an assessment builds understanding of emerging best practice as well as deep understanding of the competitive enrollment context of higher education. Furthermore, examining provider models and the learner populations for whom they have value builds deep insight into the learner-centered approach. Strategic curricular decisions will emerge from a synthesis of an institution’s knowledge of the populations, objectives, and models present in today’s global learning space. The fourth set of questions revolves around the learning process. Indeed, the learning process is extremely important in learner-centered curriculum design. The most effective designs reflect a comprehensive integration of learning theory and methods appropriate to successful learning. Therefore, the fourth learner-centered question within the Learner-Centered Curriculum Framework is: What learning theories and methods are appropriate for specific learners and the objectives they seek? What learning methods help inform us of the appropriate curricular approach to take with specific learner populations? How do we focus the curriculum on the individual learner? The American Psychological Association developed a 14 point learner-centered framework that provides an effective baseline for discussion and design. There are more than 50 major learning theories, each focused on a different aspect of learning or learner population. Synthesizing effective curriculum requires the matching of theory and practice to learner population characteristics and objectives. The point, in short, is to systematically build curriculum to incorporate effective learning methods. The fifth area of inquiry emanating from the Learner-Centered Curriculum Framework results from a complex, yet straightforward question: What is the existing curriculum architecture of the institution or educational entity? Does the architecture provide an alignment between the learner, the curriculum, and society? Curriculum Architecture refers to the design, structure, and relationships within and across an institution’s published curricular offerings. A curriculum’s architecture is foundationally defined by the formal programs of study authorized by a governing body that directly controls the rules of curriculum design and delivery. Thus, the architecture formalizes the curricular attributes an institution is committed to support and develop. It establishes alignment points with specific segments of the learner markets prescribed within an institution’s mission. Ideally, curriculum is both learner and learning centered. The curriculum architecture can also be used to synthesize an institution’s comprehensive academic master plan. The architecture of a curriculum describes the style, method of design, basic construction, key components, and underlying philosophies used to build the modules, courses, and programs that make up the entire diverse curricula. The sixth area of inquiry and discourse keenly focuses on meeting the specific and particular learning needs of the learners an institution has selected or been charged to serve. The sixth learner-centered question is: What specific curriculum can be configured to meet the learning needs of the learner population(s) an institution has chosen or been charged to serve? Will the configurations achieve intended outcomes? How will that be assessed? A particular curriculum configuration is drawn from an institution’s available (current or planned) architectural options. The configuration constructs a specific curriculum from all the elements of the architecture for a specific population seeking specific objectives using specific teaching, learning, and assessment methods. Across an institution, a wide variety of curriculum configurations are deployed. The seventh area of inquiry within the Learner-Centered Curriculum Framework addresses the design and delivery of the array of services required by learners to meet their objectives. What support services are necessary to enable specific learner population(s) to successfully complete the curriculum and meet their objectives? Services are as important within a learner-centered curriculum as is the design and configuration of learning experiences. The curriculum alone is insufficient to deliver effective and efficient learning. Advising, counseling, and assessment are among the most important processes to be integrated into curriculum design. Too often they are add-ons. Other services are required to be sure learners are available to access the curriculum and learn. For example, assessment and placement, advising, counseling, financial aid, and a host of other services are extremely important to the process of creating learner success. As each learner population is understood, services must be fused to curriculum design so that pathways can be efficiently navigated and successfully completed.